Air suspension is recommended for many suspension problems, for example because it must be possible to lower the vehicle or the load is constantly changing, but in certain situations a reinforced replacement or helper spring (VB-CoilSpring) is exactly the right solution. A reinforced replacement spring and/or helper spring supports and strengthens the existing suspension on the vehicle. The VB-CoilSpring returns the vehicle to the original (or a higher) ride height, increasing stability and, to a certain extent, the level of comfort. The VB-CoilSpring is a good option for vehicles that are always heavily laden. This is because the reinforcement to the spring force is permanent and cannot be adjusted. For the 4x4 version (4MATIC) of the Mercedes-Benz Vito/V-Class, we have developed reinforced replacement springs for both the front and rear axles. After installing the reinforced springs, the ride-height of the vehicle will increase by approximately 3 cm. Another advantage of this kit is that it is designed as a so-called "banana spring". This ensures that shock absorbers are relieved and last longer. All of the required nuts and bolts are supplied with our kit. 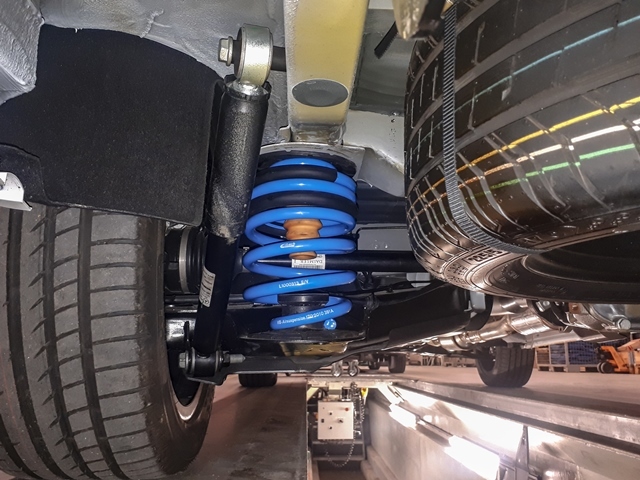 For the front wheel drive version of the Volkswagen Crafter VAN and the MAN TGE VAN we have developed a helper spring that supports the existing leaf suspension on the rear axle. After installing the helper spring, the ride-height of the vehicle will increase by approximately 1.5 to 2 cm. Would you like to order one of these VB-CoilSprings? Please contact one of our VB-Partners.